The BRICS led NDB (New Development Bank) is being promoted as an institution that serves as developing economies’ healthy and essential alternative to undemocratic International Financial Institutions (IFIs) such as the World Bank, Asian Development Bank and International Finance Corporation that are controlled by western powers. We reject such rhetoric and assert that the $100 billion NDB is designed and structured to function equally undemocratically. NDB invests in projects that do not conform with necessary environmental and social safeguards. Consequently, billions of dollars invested by NDB in critical sectors such as energy, road building and urbanization is causing extensive environmental and social impacts. We know, as a result, South Africa, a huge recipient of NDB loans, has become a site for corporate land grabs which is resulting in massive loss of livelihoods and displacement of rural and urban communities, along with rampant corruption. The prime examples of these as we understand are Eskom, Transnet and the Development Bank of Southern Africa who are among the most notorious of South Africa’s corrupt, climate-change-causing and non-consultative firms. IFIs have systematically disrupted evolution of democratic governance forcing Governments to implement regressive policies, legislation and schemes, commodify and financialise land, essential services and food production systems, which attack environment, food security and labour. They are gaining significant access to sovereign decision-making processes. They operated with legal immunity until recently when the US Supreme Court issued a judgement in the suit filed by Indian fishing communities against IFC that IFC is not above law. This immunity had always encouraged them to finance projects without a proper appraisal of their environmental and social impacts, and due diligence of their financial and economic consequences. IFIs typically invest in massive projects in critical sectors. 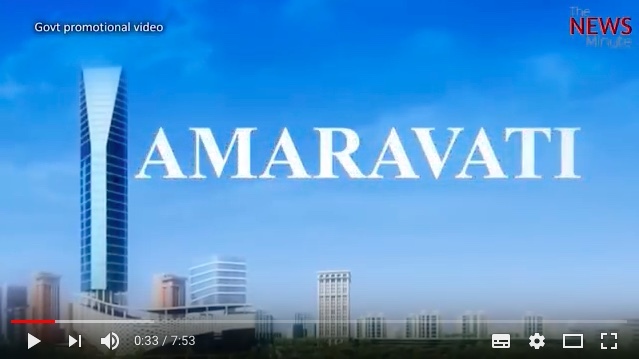 A slew of such highly destructive and economically disastrous mega projects in India include Industrial corridors – Bharatmala (roads and highways expansion project), Sagarmala (creating sea-routes linked to tens of new ports), bullet train, and smart cities. The massive scales of such projects have little to do with need and necessity. Very often, a network of transnational corporations are the beneficiaries of the massive contracts that ensue. We understand it’s a way of making money out of money. The result of such development is systemic human rights violations, social disruption, and environmental destruction. And, these mega projects typically end up in massive financial losses and lead to devastating economic instability in regional and national economies. Communities in farms, coastal areas and cities are uprooted in the process, accentuating impoverishment and unemployment at massive scales. People end up burdened with crippling debts merely to survive. Further, outsourcing the formulation of critical policies of a country relating to labour, food security, defence, water, land, farming, etc., to a variety of think-tanks and foreign consultancies work to maximise corporate control over peoples’ lives and natural resources. Institutions of democracy and decision-making of a country, such as the Parliament, are kept in the dark and global financial powers are making deep forays into sovereign decision making. Moreover, the aggressive privatisation of essential services such as electricity, water, health, food supply, public transport and education, is causing a rapid escalation of the living cost of the majority population. Communities on the frontlines of resistance to mega undemocratic and destructive projects are facing extreme forms of violence and terror and becoming victims of systemic abuse of executive power of the State. Instead of responding to popular and people’s genuine demands, when farmers, Adivasis, Dalits and workers organise to demand just action by the State, they have often been met with state repression. The present social upheaval in India and a range of arrests of dissenters, writers, cultural and social activists across India based on fabricated cases are indicative of increasing repression. Social movements and peoples organisations representing Adivasis, Dalits, indigenous peoples, women, farmers, fisherfolk, forest workers, hawkers, artisans, unorganised workers and civil society from across India, together with solidarity groups from India resolve that undemocratic International Financial Institutions (IFIs) have no role in a democratic polity, and therefore need to be shut down. These institutions, including NDB, trample on peoples’ rights, disregard national sovereignty, tear into the very fabric of constitutionally guaranteed governance and thus undermine India’s economic and political security. We pledge in solidarity with the peoples’ movements, communities and civil society groups of South Africa, at this occasion of People’s Dialogue at Cape Town, to resolve to tirelessly work against subordination of governments to corporate power, against exploitation of human and natural resources, against discrimination, against social, economic and environmental injustices, against corruption, loot and violence. We will continue resisting the prevailing financial hegemony of undemocratic and unaccountable financial institutions such as the BRICS-led NDB. We resolve to push for people-centred alternatives in all sectors of the economy and to advance an inclusive model of development in which finance and infrastructure support the vulnerable and the poor communities. We continue remaining dedicated to building a society based on democratic and secular principles that ensure freedom, equality, equity, dignity, fraternity, love and respect for all, deeply respecting Mother Earth’s rights. March 1, 2019, New Delhi: Peoples movements and civil society organisations from across India welcomes the US Supreme Court’s landmark judgement that ends the absolute immunity of the international organisations like the World Bank Group. The US Supreme Court, in its 7-1 verdict in the Budha Ismail Jam v. International Finance Corporation (IFC), had yesterday ruled that international organisations like the World Bank Group can be sued in U.S. courts. 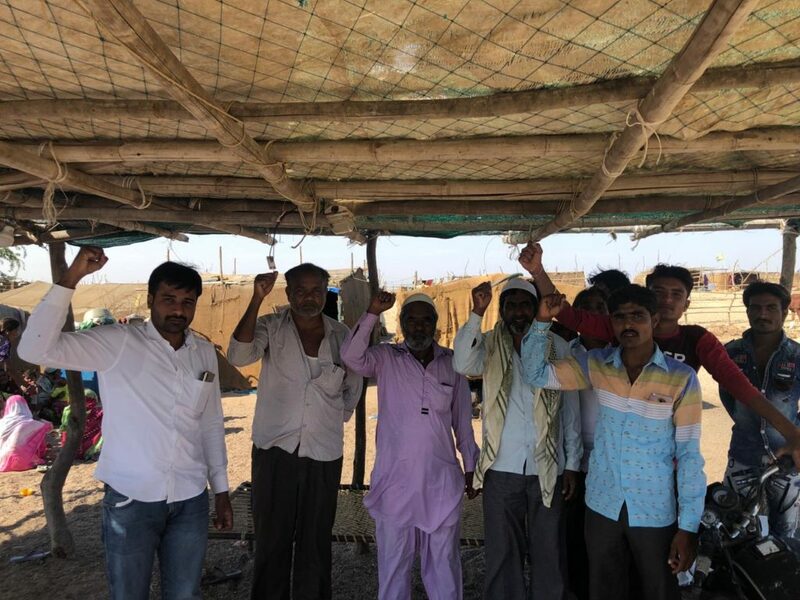 The construction of the IFC-funded Tata Mundra UMPP had destroyed marine fisheries resources and traditional fishing practices like the pagadia fishing, which has adversely affected the livelihood of the locals. The people had objected to the destruction of their coasts and sea in the name of development projects, and opening up of the coasts to polluting industries, particularly the thermal plants. Much of India’s polluting industries are concentrated around the coast and the new plan to industrialise the coast through port-led development will only intensify the resource grab and destruction of the livelihood of fishers and farmers. Please visit here for more background on the case. 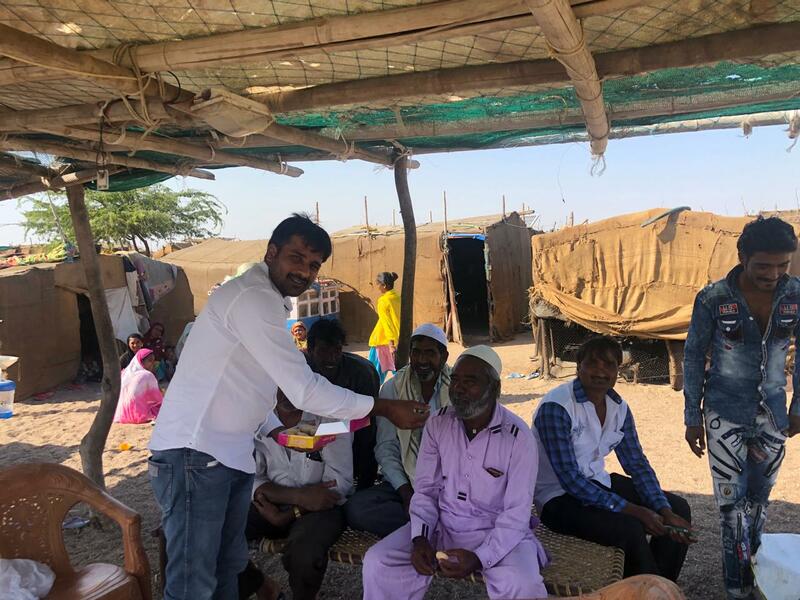 February 28, 2019, Mundra, Gujarat: Machimar Adhikar Sangharsh Sangathan (MASS) and the affected communities by the Tata Mundra Ultra Mega Project welcomes the historic decision of the US supreme court which ruled that international organizations like the International Finance Corporation of the World Bank Group do not enjoy absolute immunity, and can be sued. The construction of the Tata Mundra UMPP has destroyed marine fisheries resources and traditional fishing practices like the pagadia fishing, which has adversely affected our livelihood. The fishers had objected to their coasts and sea getting destroyed in the name of development projects and opening up of coasts to polluting industries, particularly the thermal plants. Much of India’s polluting industries are concentrated around the coast and the new plan to industrialise the coast through port-led development will only intensify the resource grab and destruction of the livelihood of fishers and farmers. The US Supreme Court’s verdict is a call for accountability from the national and international financial institutions, which cannot escape accountability under the veil of immunity any more. The global financial institutions have to recognise the law of the land and accept that they are answerable to the courts and people. The case, Budha Jam v. IFC, brought by fishermen and farmers affected by IFC-funded Tata’s Mundra Ultra Mega Project challenged the absolute immunity enjoyed so far by international organisations like IFC. MASS salutes the fishers of Mundra who lead the struggle over the past decade and challenged the World Bank at various levels. We thank those who have contributed in our struggle particularly the Earth Rights International and Stanford Law School Supreme Court Litigation Clinic, which represented our case pro bono. We also thank all the national and international groups who helped us in the fight, gave solidarity and stood with us shoulder to shoulder. We stand together in struggle. Delhi: New Delhi: In a historic 7-1 decision, the U.S. Supreme Court decided in Jam v. IFC that international organizations like the International Finance Corporation of the World Bank Group do not enjoy absolute immunity. The case involves an IFC-financed power plant in Mundra, Gujarat. The plaintiffs are members of local fishing and farming communities whose livelihoods, air quality, and drinking water have been devastated by the project. They alleged that the IFC and the project developers knew about these risks in advance but nevertheless chose to recklessly push forward with the project without proper protections in place. The complainants originally tried to raise their concerns through the Compliance Advisor Ombudsman (CAO), the IFC’s internal grievance mechanism, but when the IFC’s leadership ignored the grievance body’s conclusions, they reluctantly filed suit in the United States as a last resort. The EarthRights International represented the villagers, along with the Stanford Law School Supreme Court Litigation Clinic. The IFC is headquartered in Washington, DC, along with the rest of the World Bank Group, because the U.S. government is by far the largest shareholder in these organizations. The U.S. government has long supported the villagers’ interpretation of the law: that international organizations can be sued for their commercial activities or for causing injuries in the United States. The U.S. Departments of Justice and State submitted an amicus curiae brief in support of the plaintiffs’ position, as did members of Congress from both parties. The IFC argued that allowing it to be sued would be disastrous, but the Supreme Court, in an opinion by Chief Justice John Roberts, found these concerns to be “inflated.” The Court noted that, unlike many international organizations, the IFC’s founding members did not grant the organization absolute immunity in its charter. The case is Docket No. 17-1011. Justice Brett Kavanaugh recused himself, because he was on the U.S. Court of Appeals for the D.C. Circuit when the case was heard there. Justice Stephen Breyer was the sole dissenter, arguing that a “broad exposure to liability” for international organizations runs counter to Congress’ original purpose in providing immunity. Now that the Supreme Court has established that the World Bank Group can be sued, the case will return to the lower courts for further litigation. Another case against the IFC is also expected to proceed in the U.S. District Court for the State of Delaware. The case, Juana Doe et al v. IFC, involves IFC projects that have been linked to murders, torture, and other violence by paramilitary groups and death squads in Honduras. EarthRights International represents the plaintiffs, whose identities are kept anonymous to protect them from retaliation. From the start, the IFC recognized that the Tata Mundra coal-fired power plant was a high-risk project that could have significant adverse impacts on local communities and their environment. Despite knowing the risks, the IFC provided a critical $450 million loan in 2008, enabling the project’s construction and giving the IFC immense influence over project design and operation. Yet the IFC failed to take reasonable steps to prevent the harms it predicted and failed to ensure that the project abided by the environmental and social conditions of IFC involvement. As predicted, the plant has caused significant harm to the communities living in its shadow. Construction of the plant destroyed vital sources of water used for drinking and irrigation. Coal ash has contaminated crops and fish laid out to dry, air pollutants are at levels dangerous to human health, and there has already been a rise in respiratory problems. The enormous quantity of thermal pollution – hot water released from the plant – has destroyed the local marine environment and the fish populations that fishermen like Budha Ismail Jam rely on to support their families. Although a 2015 law required all plants to install cooling towers to minimize thermal pollution by the end of 2017, the Tata plant has failed to do so. A nine-mile-long coal conveyor belt, which transports coal from the port to the Plant, runs next to local villages and near fishing grounds. Coal dust from the conveyor and fly ash from the plant frequently contaminate drying fish, reducing their value, damage agricultural production, and cover homes and property. Some air pollutants, including particulate matter, are already present at levels dangerous to human health, in violation of Indian air quality standards and the conditions of IFC funding, and respiratory problems, especially among children and the elderly, are on the rise. The IFC’s own internal compliance mechanism, the Compliance Advisor Ombudsman (CAO), issued a scathing report in 2013 confirming that the IFC had failed to ensure the Tata Mundra project complied with the environmental and social conditions of the IFC’s loan at virtually every stage of the project and calling for the IFC to take remedial action. IFC’s management responded to the CAO by rejecting most of its findings and ignoring others. In a follow-up report in early 2017, the CAO observed that the IFC remained out of compliance and had failed to take any meaningful steps to remedy the situation. The harms suffered by the plaintiffs are all the more regrettable because the project made no economic sense from the beginning. In 2017, in fact, Tata Power began trying to unload a majority of its shares in the project for one rupee (a few cents) because of the losses it has suffered and will suffer going forward. At the moment, the plant is operating at only one-fifth capacity in part because India has an oversupply of electricity. The case is Budha Ismail Jam v. International Finance Corp., No. 17-1011. 25 years of Inspection Panel has a special significance for India, having played a key role in its formation. As in the case of all safeguard and other policies, the independent accountability mechanisms (IAMs) of multilateral development banks are also a result of the valiant struggle fought by the communities affected of various projected financed by these institutions. Particularly the struggle led by Narmada Bachao Andolan since the late ‘80s demanding a review of Sardar Sarovar (Narmada) dam for its social, environmental and economic costs leading to the formation of Independent Review (first time in World Bank’s history) was a watershed moment in the history of struggles against international financial institutions. This is a compilation of six prominent cases from India to different IAMs. Each one of them had different experiences and results. These are reminders to us that while these are tools for communities to highlight the violations of their rights, one needs to go beyond IAMs for holding international financial institutions accountable. The Inspection Panel is completing 25 years in its role, as an accountability mechanism of the World Bank. As you are aware, the Bank’s failure to comply with its operating policies was seen by the entire world in the Bank’s financing with the Sardar Sarovar Dam project on River Narmada. The tenacity of massive grass-roots uprisings from our communities in the 80’s and the sustained hard work of our social movements along with our resoluteness to link it with international coalitions to question the hegemony of the Bank, subsequently led the Bank, for the first time, to commission an independent review of its project. The Independent Review Committee (Morse Committee) constituted by the Bank in 1991 to review the social and environmental costs and benefits of the dam, after years of consistent struggle by Narmada Bachao Andolan (Save Narmada Movement) and its allies led to a demand from the civil society around the globe for the creation of a grievance redressal system for project-affected communities, which ultimately pressurized the Bank to constitute the Inspection Panel in 1993. We expected this might be a crucial backstop and an opportunity for us to raise our issues of livelihoods, economic loss, displacement from our lands, alienation from natural resources, destruction of environment and threat to our biodiversity and cultural hotspots, where Bank invested in large, supposedly ‘development’ projects like mega dams, energy and other infrastructure projects. Yet, the outcome we expected rarely delivered sufficient remedy for the harm and losses people have experienced over the years. A number of accountability mechanisms over the next couple of decades in several development finance institutions were formed following the model of World Bank, commonly known as ‘Independent Accountability Mechanisms’[IAMs]. Each year the number of complaints rise which is an indication of the increasing number of grievous projects happening around the world. While IAMs of most MDBs are advertised to provide strong and just processes, many of our experiences imply that the banks are accommodating practices which suit their own needs and their clients, which are borrowing countries and agencies, and not the people for whom the IAMs were built to serve. Many a time, we have been disappointed by these mechanisms, since these are designed by the banks who are lending for disastrous projects in our lands. And as a result, the already existing narrow mandate of IAMs is further restricted. In our efforts to hold the lending bank accountable, the communities are always presented with the arduous process of learning the complex formalities and detailed procedures to initially approach the IAMs and get our grievances registered. Our many years’ time and energy then is channelised into seeing through the various cycles of these complaint handling mechanisms, that our entire efforts go into this process, and often our complaint gets dropped off in midst of the procedural rules of the IAMs. People are made to wait many months to clear procedural levels and our cases with the IAMs get highly unpredictable. Further, we face intimidation and reprisals from the state and project agencies for having contacted the IAMs who themselves do not possess any authority to address the violations hurled out to us when we seek dignity, fair treatment and justice from them. There are many of us who feel a loss of morale after long years of struggling with lenders when we fail to see concrete benefits or changes in our circumstances, by which time considerable irreplaceable harm is already done to our lives, environment and livelihoods. In this manner, our immediate and larger goal of holding banks for their failure to consult with and obtain consent from communities before devising action plans for our lands, water and forests is deflected in the pretext of problem-solving and grievance hearing offered to us in the name of IAMs. With over 50 registered complaints sent to different IAMS from India in the past 25 years, many more left unregistered due to technical reasons and only a few got investigated, assessed and monitored at different levels, we have a baggage of mixed experiences with the IAMs. A few of the prominent cases from India apart from Narmada project are Vishnugad Pipalkoti Hydro Electric Project [WB’s IP], Tata Mega Ultra-01/Mundra and Anjar [IFC’s CAO & ADB’s CRP], India Infrastructure Fund-01/Dhenkanal District [IFC’s CAO], Allain Duhangan Hydro Power Limited-01/Himachal Pradesh [IFC’s CAO] and Mumbai Urban Transport Project (2009) [WB’s IP]. As we now know, what is being witnessed recently is an influx of approved and proposed investments majorly in energy, transport, steel, roads, urban projects, bullet trains, industrial zones/corridors, smart cities, water privatization and other mega projects in India. This has been financed from different multilateral and bilateral sources, foreign corporations, private banks as well as Export-Import Banks (ExIm Banks). It has become a brutal challenge for communities, social movements and CSOs, with lenders and governments constantly shutting their eyes and ears to us who demand accountability for their actions. A compelling and timely need has arisen among diverse groups amongst us to gather together and critically analyze the various trajectories of our engagements with accountability mechanisms of MDBs in order to bring together past 25 years’ learning, insights and reflections of various actors of this accountability process. This urging demand is also an attempt to define the collective experiences in India among our social movements, projected-affected communities and CSOs with IAMs and lending banks, especially appropriating the global political opportunity of Inspection Panel celebrating its 25 years this year. The schedule and list of speakers will be shared soon. Krishnakant of the Paryavaran Suraksha Samiti, Gujarat on the rationale of the proposed bullet train between Mumbai and Ahmedabad. Soumya Dutta, Beyond Copenhagen Collective and PAIRVI, linking IFIs, their push for Infrastructure, and impact on commons. Why Should People be Vigilant About Asian Infrastructure Investment Bank? At the Convention, there will be multiple workshops organised by the WGonIFIs in Mumbai during June 21-23, 2018. You can click here to participate as an individual or an organisation. You can also organise workshops. A latest report has asked Asian Infrastructure Investment Bank (AIIB) to “tread carefully” on National Infrastructure and Investment Fund (NIIF), a fund of fund that seeks to create long-term value for domestic and international investors seeking investment in energy, transportation, housing, water, waste management and other infrastructure-related sectors in India. The report, released by the Bank Information Centre-Europe and Centre for Financial Accountability, titled ‘Financing the future? The Asian Infrastructure Investment Bank and India’s National Investment and Infrastructure Fund’ warns that the AIIB do due diligence at all levels before approving a new $200m deal with India in April for fear of turning the key on some highly-controversial projects now being stalled by local community opposition. The Prime Minister Narendra Modi has also vowed to revive long-stalled infrastructure projects, especially in the coal, power, petroleum, railways and road sectors. Quoting a recent data from the Centre for Monitoring Indian Economy Pvt. Ltd (CMIE), the report mentions that the value of stalled infrastructure projects in the quarter ended September increased to Rs13.22 trillion. The CMIE’s analysis shows that 39.04% of the total stalled projects were in the electricity sector by value. The report observes that the first proposed Indian investment on the AIIB’s books in 2018 reflects both the Indian government’s prioritisation of infrastructure financing, and the interest of AIIB in both India and financial intermediary (FI) lending, a financial model involving investing indirectly through third parties such as an infrastructure or private equity funds — which makes it difficult to track the money — thus posing a substantial risk of being spent on the coal or other harmful projects by the back door. The report observed that FI lending is becoming the dominant model of financing at development banks. The AIIB started FI lending in 2017, when it approved approving three FI investments: in Indonesia’s Regional Infrastructure Development Fund, the India Infrastructure Fund, and the Emerging Asia Fund. Next up is a potential $200 million commitment to India’s National Investment and Infrastructure Fund. “Around the world, we have seen how extremely risky this model of ‘hands-off’ lending through financial intermediaries can be. Without stronger safeguards and transparency, the AIIB will simply lose sight of its original investment and the damage it could cause,” said BIC Europe Campaigns Director and co-author Kate Geary in a media release. “The AIIB must tread very carefully here because it is still accountable for any project that harms local communities in India or damages the environment – regardless of how much distance the AIIB might claim to have from it,” Geary said. Exhorting AIIB to learn from the IFC’s problematic experience with its FI portfolio and to avoid the associated social, environmental and reputational damage, the report recommends putting in place mandatory robust policies and systems around financial intermediary investments to ensure transparency, accountability and efficient channels of communication with all stakeholders. The recommendations include: Scrutinising the existing project portfolio and pipeline of proposed FI clients; Reviewing the track record of the FI client in applying the environmental and social framework and making this assessment public; Ensuring that FI clients require sub-projects to be compliant with all AIIB policies especially the Environmental and Social Framework (ESF), Complaints Handling Mechanism (CHM), Public Information Policy, and all relevant sectoral strategies and guidelines; Monitoring the proposed client’s social and environmental due diligence and supervision of its investment; and Ensuring FI sub-project affected communities have access to redress, including through the AIIB’s accountability mechanism. The World Development Report (WDR) is the World Bank’s development research and policy review report published annually. Started by IBRD since 1978, this report is intended to provide deep and extensive analysis on one particular aspect of economic development, every year. The solutions and policy messages brought out in this report is widely scrutinised by researchers, policy makers, governments and civil society since this ‘flagship’ report is supposedly the Bank’s highly prized research contribution to the development world. Heavy research budgets, far-reaching dissemination and the legitimacy of ‘World Bank’ publication make this a cherished one for the Bank. Few of the previous years’ reports focused on education, health, environment, risk management, poverty, the role of the state, youth, agriculture, equity and public services delivery. 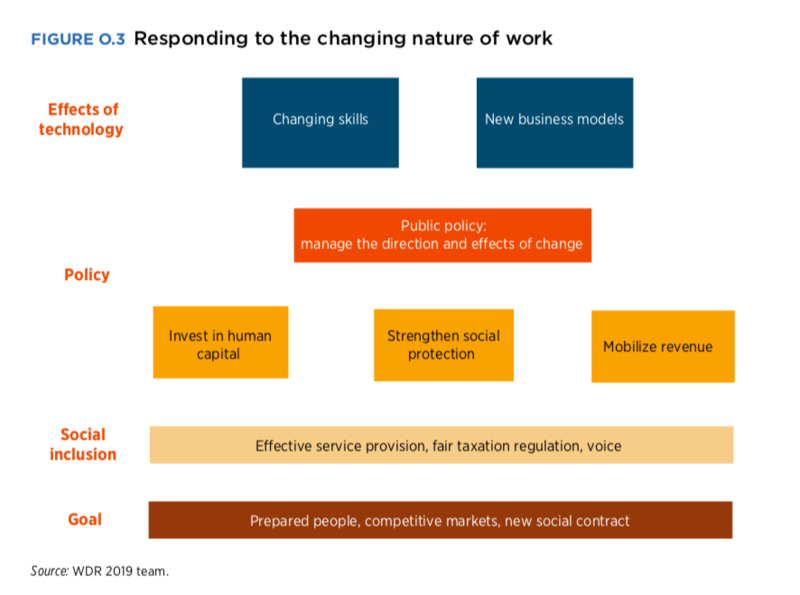 The World Development Report 2019: Changing Nature of Work (WDR 2019) examines the changing nature of work and firms, laying emphasis on the impact of technology and digital innovation on the current global economy. But what made this report a highly talked about one in the recent debates on development? The Bank’s previous president Jim Yong Kim writes in his foreword that this document shows the transparency of work since it was open to all for modification of drafts, almost every week online. And then, there were more than a million downloads even before halfway its publication which also made it the most downloaded report in 2018. Another occasion to note is that its preparatory phase was delayed by the Bank’s then chief economist Paul Romer’s resignation[he was the first director of WDR 2019], over his controversial remarks on the direct correlation between the political leanings of the staff and annual rankings of countries in Ease of Doing Business process of the Bank. Subsequently, the work was taken over by Simeon Djankov, who is the Founding Director of the much sought-after, yet much criticised, Doing Business Reports. Yet another highlight of this report was the introduction of Human Capital Index [The human capital project examined in WDR 2019 will be explained in another section of this article], again contested, where countries will be now ranked annually in terms of a child attaining optimum productivity after having attained education and full health from birth till 18 years of age. But above all, this report faces strong criticism for its two pertinent direct messages – deregulation of businesses and shifting obligations of firms/employers for social protection of workers/employees to the shoulders of the State. Few voices have come out globally carefully analysing the nuances of various explanations given by the Bank to establish the context for its suggestions for the future of work for the evolving economy. It is true that the report has failed to give a rounded, well-thought critique on the actual challenges faced by workers in the accelerated transformation of the world of work. To put it short, critically speaking, this report is inherently characterised on anti-worker perspective. The deregulatory solution brought out in this report parrots almost all the editions of Doing Business Reports since 2003 promoting private sector development and having influenced watering down of many regulatory policies across countries to facilitate rapid entry and development of the business. This was eagerly executed by governments because labour regulations policies allegedly stifled exciting investments and swift economic growth. It is ironical that the same Bank, in its WDR 2013: Jobs, after extensive review on the link between labour regulation and employment [following a massive hue and cry from few governments, labour movements and ILO], had stated that this ‘link’ was non-existent. This obviously shows WDR 2019 disproves the exhaustive findings of WDR 2013! Moreover, the Bank, during its previous Annual Meetings at Bali during October 2018 had introduced its new Environmental and Social Framework, where respect for workers’ rights in Bank’s projects was entered as Labour Safeguards [ESS2– Labour and Working Conditions]. Not less than two weeks later after the much appreciation for Bank’s new safeguard policy, came WDR 2019 in direct and stark contrasting opinions. This is highly contradictory and problematic from the Bank’s side sending two conflicting messages in two separate yet distinguished policy publications. Story Line of WDR 2019 The world of work is progressing rapidly with technological and digital innovations including robots and Artificial Intelligence. Stable jobs are giving way to Gig- jobs and digital market places paved the way for platform market places and superstar firms. “Innovation will continue to accelerate” and there are growing chances, as already seen in many countries, that automation would replace the low-skilled redundant labour. Hence the jobs remaining outside automation would require highly skilled work-force that would have exceptional cognitive skills [logic, reasoning, critical thinking], socio-behavioural skills [teamwork, resilience, confidence, leadership] and skills of predictive adaptability [‘an individual now can have not many jobs but different careers in one lifetime’]. In order to feed into this need for a productive workforce, education and health must be critical for every child [starting from birth, especially until 5 years of age] and adult [adult learning outside the school and tertiary education. Therefore, the bank’s new Human Capital Project and Human Capital Index examines closely at this aspect of development and will recommend policy actions through country strategies. And what about those who fail to fall in the ‘formal’ and productive workforce, namely the informal workers? Well, they will be given social assistance [various forms of UBI, negative tax], social insurance and State will protect them with basic minimum, and if possible reskilling and upskilling initiatives would be undertaken]. All said, the gap of finances which then the State is faced with can be covered by mobilizing tax revenue – by imposing VAT, excise tax on tobacco, alcohol, sugar, etc. and by expanding the tax coverage base, along with further strengthening of global efforts of OECD and G-20 to agree together on preventing tax erosion and profit-shifting through tax havens. And thereafter, to accommodate all these policy changes, there should be political incentives for governments through new social contracts for the State to protect all, whether they are formal or informal workers, whether they are employed or unemployed and wherein the returns to work for the State is also guaranteed. It finally follows that the goal of social inclusion is achieved thus. Well, aren’t we all made happy … and all looks rosy! Minimum wages, which ensured fair returns to workers against exploitation of employers, shall be reduced – employers are free to reduce the wages to the bare minimum. You and I can be fired from work at will. Because we pose structural rigidity to firms. Already data is given in the report of advanced economies enjoying the productivity of robots, while the employment growth has been steady and has not been affected. But how can these be ideated with that of situations in poor and low-middle income countries? The present Bismarckian model of social security scheme based on workers’ and employers’ voluntary contribution will be changed since they do not include the informal workers who are 2/3rdof developing country population. The informality of works worldwide poses a huge problem of workers not being able to be adapted to the past faced requirements of the transforming economy. Majority of us will be jobless unless we keep on learning if we are adults. No mention of senior citizens in the report. Digital marketplaces, to read accurately, ‘intangible marketplaces’ get away with not having to pay taxes and profit-shifting. So, let the governments finance their basic social welfare schemes and assistance by expanding the tax base and increasing regressive VAT. Imagine how a poor or developing nation would suffer from the burden of it – the ordinary man’s wages go into his daily sustenance and will not have savings, and then he needs to pay VAT over what he consumes for his survival! Various forms of Universal Basic Income [UBI] are recommended. The following broad critique has been collated and arranged from all the sources given in this article, hyperlinked at various instances. Central assertions of the document [except maybe a little in the Building Human Capital and Lifelong learning] are devoid of solid and reliable data and genuine analysis. The Bank has perhaps allowed right-wing ideologies to trickle down into their research reports. While stressing the need to acknowledge the rise of platform markets and independent contractors, legal protection and safeguards for the emerging distinct labour force [who have also met serious resistance while campaigning for their rights like Uber Drivers] have not been addressed. The report has not just suggested eliminating the responsibility of social protection from the private sector and superstar firms, but altogether failed to address and recall the need of commitment from advanced nations to contribute in global development, by limiting the scope of the report to just low and middle-income economy experiments and discussions. Much disappointing and worse is the fact that, here, human beings are pitted as human capital only, to be tailor-made for ‘productivity’. In the impatient race for economic growth and capital, the creativity of humanity, the plight of less privileged and marginalised, the ever-present resistances of people’s groups and movements, declining natural resources and accommodating other living beings, much less…the essence of life and living itself is non-existent in this ‘development’ report.